Limit the amount of words a user can submit inside Single Line, Paragraph and Post Body text fields. 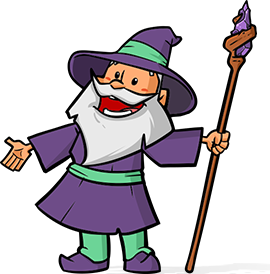 The Word Count perk allows you to limit the amount of words a user can submit inside Single Line, Paragraph and Post Body text fields. This works for both a minimum amount of words and/or a maximum amount of words. 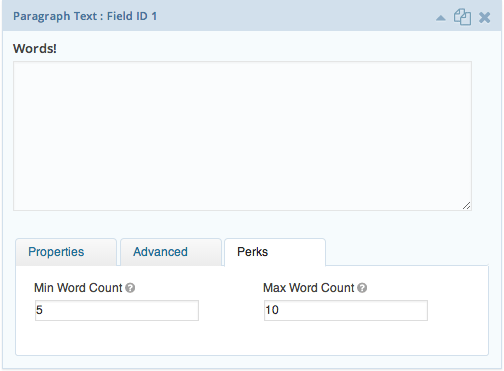 When a form is submitted with a field that contains the Word Count perk settings this perk intercepts the form and counts the amount of words submitted within the field. If the field contains too few or too many words then the form is returned with an error. After you have installed and activated this perk create a new form or edit an existing one. Once on the edit form page create a new Single Line, Paragraph or Post Body text field. After the field has been added click the field to open the field’s settings. Once there click the Perks tab, once there you should notice two additional fields. One labeled Min Word Count and the other Max Word Count. Within those fields input the minimum word count and the maximum word count respectively. Click Update Form or Save Form. Fixed styling issue with left and right aligned form labels.